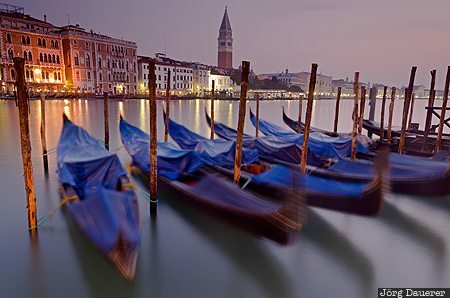 Moving gondolas in Venice with the Grand Canal (Canal Grande) and St Mark's Campanile the background seen at the blue hour before sunrise. The motion of the water in conjunction with a long exposure time blurs the gondolas. Venice is in Veneto in northern Italy. This photo was taken in the morning of a sunny day in November of 2011. This photo is part of the exhibition Blue Hour (October 2016). This photo was taken with a digital camera.